Royal College of Art graduate Jeongwon Ji has made her own bioplastic from crab shells. Aiming to make a more tactile casing for electronic products, Jeongwon Ji extracted a derivatine of glucose called chitin from crustaceans and developed her own plastic from it by trial and error in the workshop. The resulting material, which she calls Crustic, combines the chitin with water and small amount of glycerin. "The Chinese mitten crab from Asia is one of the most invasive species and they are taking over the rivers in the UK," Jeongwon Ji told Dezeen. "The crabs are unwanted here so I wanted to work out what we can do with them as a resource instead." The water-based mixture takes much longer to cure than conventional plastics but the ingredients are completely non-toxic, she explained. "Although production time is longer, this nontoxic process can improve the work life of those who manufacture our electronics." 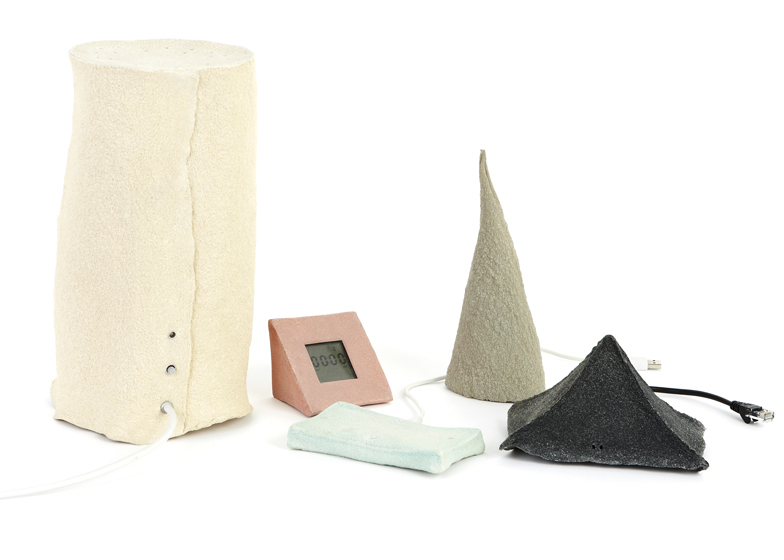 In the Design Products department of the Royal College of Art graduate show last week, the designer presented her material samples and experiments alongside conceptual electronic projects with casings made of Crustic, including an alarm clock, humidifier, computer trackpad, torch and WiFi router. Although they were all made in accurate geometric wooden moulds, the material becomes rough and distorts as it cures, resulting in tactile and organic forms. "I wanted to challenge the archetypes of electronic products by using tactile surfaces and making forms that look like they are made of something different, something natural," she said. A couple of months ago we featured a pavilion based on the structure of chitin in a lobster's shell and in 2011 Italian designers Formafantasma presented a range of vessels made from natural polymers they'd cooked up themselves. Other projects presented at Show RCA included paper-pulp helmets for cycle-hire schemes and living food that wriggles around on the plate. BioElectric challenges the archetypes of electronics through material exploration. Industrial processes have streamlined manufactured products, but what if we allow new materials to be expressive and tactile? Like many of today’s electronic components, the Chinese Mitten Crab comes from Asia. This species invades our rivers, and is an unwanted, local resource. I extracted Chitin polymers from crushed crab shells, and perfecting chemical-free “slow production” methods to make bio-plastics for the casings of electronic products. Although production time is longer, this nontoxic process can improve the work life of those who manufacture our electronics. Crustic is a crustacean-based biocompatible plastic that Jeongwon Ji developed for her BioElectric project to enhance tactile pleasure. The production time of Crustic is longer because the use of water instead of artificial chemicals. Crustic is made out of chitin derived from crab shells and water, combining with a small amount of red agile and glycerin.